Just six months after its introduction at WWDC 2014, Apple's Swift continues to generate immense interest with developers and is now the 22nd most popular programming language around, according to new rankings published on Thursday. 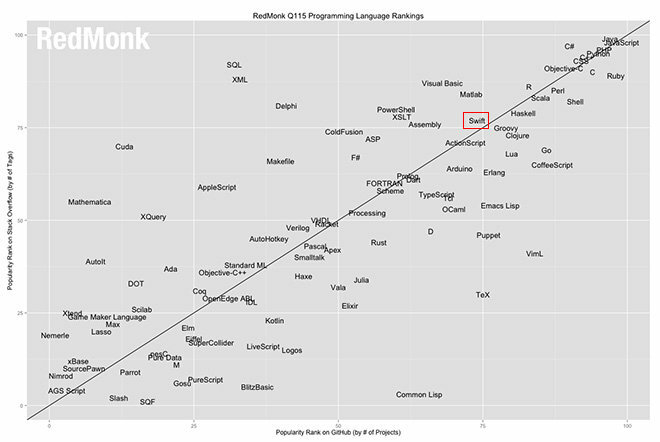 In its semi-annual programming language rankings for January, research firm RedMonk found developer interest in Apple's Swift has grown dramatically since its debut last June, jumping 46 spots over the last two quarters. RedMonk's results are compiled as a function of the number of active GitHub projects and tags counted in Stack Overflow. The report notes Swift's level of growth is "essentially unprecedented" as compared against other languages. For example, Google's "Go" was introduced in 2009 and only now hit top-20 status. While the rankings are not indicative of commercial market trends, the results offer a broad overview of individual developer interest. When we see dramatic growth from a language it typically has jumped somewhere between 5 and 10 spots, and the closer the language gets to the Top 20 or within it, the more difficult growth is to come by. And yet Swift has gone from our 68th ranked language during Q3 to number 22 this quarter, a jump of 46 spots. Swift's announcement at WWDC 2014 last June came as a surprise to many, with Apple positioning the language as heir apparent to Objective-C. The iOS- and Mac-centric tool reached version 1.0 status and was distributed in September as part of Xcode 6.0. Most recently, Apple and IBM turned to Swift to build 100 enterprise apps with corresponding services in a watershed collaboration. RedMonk expects Swift to maintain trajectory and breach the top 20 by the time its next report comes out in the third quarter.